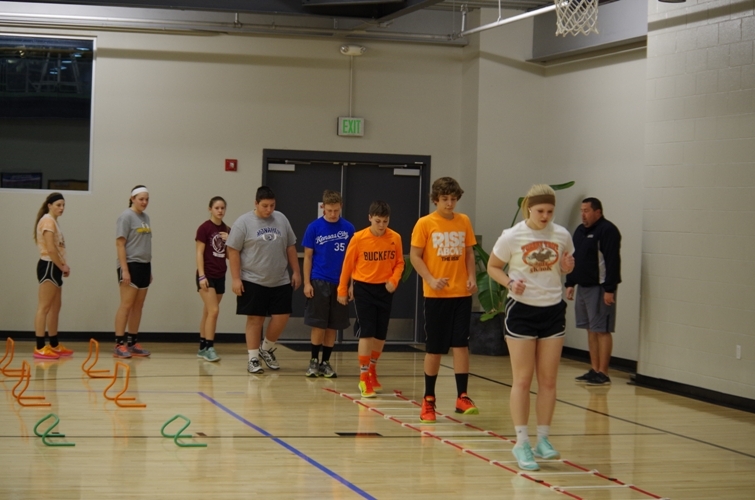 Hays Medical Center’s Athletic Edge training program began its winter session Monday at HaysMed’s Center for Health Improvement. Eight athletes from different schools attended the first night to participate in drills designed to enhance athletic ability and improve strength, speed, agility and mental focus. The program has been in place for years, and has served athletes from age 10 through college from areas including Hays, Victoria, Ellis, Stockton and LaCrosse, to name a few. Shawn Landers, certified athletic trainer at HaysMed, instructs the group. Landers has led the program since it first started, and said its benefits help athletes reach personal goals while keeping them on track outside of their sport seasons. Speed, agility, balance and strength were just a few of the focuses during Monday’s session. Using an agility ladder, medicine balls, resistance bands, weights and other equipment, athletes pushed themselves to perform at the best of their abilities. Sisters Madison Prough, senior at Hays High, and Cassidy Prough, eighth-grader at Hays Middle School, teamed up for many of the challenges. Both said they have participated in Athletic Edge before. “It helps keep me strong and by being strong you don’t get injured as much,” Madison Prough said. “It’s also helped with my agility and speed over the years. The Hays High senior said she has committed to playing volleyball for Fort Hays State University next year. Her sister, Cassidy, who plays both volleyball and softball, said speed was the main benefit for her. “It’s helped me get a lot faster and it keeps me in good shape,” she said. Thomas More Prep-Marian freshman Ryan Hernandez, a football player, said he has goals to improve both his speed and footwork. Athletic Edge offers both gym workouts with no weight training, and weight training in addition to the conditioning. The options can be tailored to an athlete’s needs, according to Landers. Athletes who enter the program sometimes have different goals and interests in mind. Some join in hope of improving skills enough to gain more playing time during the season, but some have no interest in sports and simply want to take part in the workout. “Gaining self confidence and feeling stronger is what it’s about,” Landers said. For the next few weeks, athletes can still sign up to join in on the winter session, which is held Mondays and Thursdays from 6 to 8 p.m. and Saturdays from 1 to 3 p.m. The summer session will start at the beginning of June. To sign up, or for questions or additional information, call Landers at (785) 623-6369 or email shawn.landers@haysmed.com.